Clemson Girl: Kiss me, I'm a Clemson Girl! Kiss me, I'm a Clemson Girl! Valentine's Day has come and gone, and now it's time to prep for one of our most favorite holidays - St. Patrick's Day! We are feeling super lucky to bring back a favorite Clemson Girl t-shirt that is a must-have for every Clemson Girl to wear on St. Patrick's Day. Back by popular demand, we are selling the super cute 'Kiss Me, I'm a Clemson Girl' t-shirts. 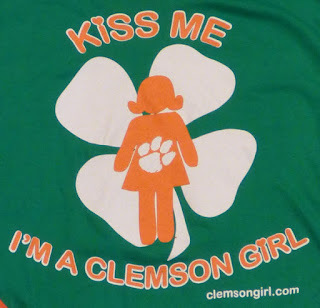 St. Patrick's Day is just about a month away - so purchase your 'Kiss Me, I'm a Clemson Girl' shirts soon so you can get it in time to wear your 'green' and your Clemson pride for all of the St. Patrick's Day celebrations. We hope you'll also share your photos with us of you wearing your 'Kiss Me, I'm a Clemson Girl' shirts too - on Facebook, Twitter, or Instagram!